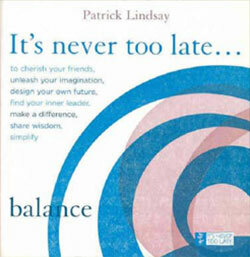 Patrick passionately believes that it’s never too late to be the best we can … or to do inspirational, encouraging and positive things for ourselves, our workmates and our loved-ones. Often we put them off because our lives seem so entangled or we feel overwhelmed by choice. How do we start? By making small, humble changes that create far-reaching ripples in the rest of our lives. Sometimes it just takes a gentle reminder of the simple things we can do to make our lives more satisfying, enjoyable and to help find balance. Patrick believes that, whatever our age, whatever our stage in life, it’s never too late to take control of our destinies, rethink our priorities, rekindle our passions, chase our dreams and make a difference in our world. It’s never too late to design your own future.